Wake up with Glenn Davis, Sr. VP, Growth Execution and Client Engagement UnitedHealth Group on Predictable Revenue Radio at 9am Live. Has Technology Crushed the Art and Discipline of Sales? Kevin Dunworth, CEO/Founder Celling Sciences, CEO Celling Biosciences is on Ready, Set, Grow! with Laura Patterson. Nancy Nardin joins Sales Enablement Radio, Got an Inferiority Complex about Sales Enablement? Matt Gorniak is Matt's Guest on Sales Pipeline Radio, How to Optimize Reviews to Accelerate Sales for Your B2B Products. Kyla O'Connell welcomes Hube Hopkins to talk about Achieving Aggressive Growth Goals with Digital Marketing. Our live broadcast day ends with DiscoverORG's president and host, Katie Bullard, Matt Wheeler, CEO of QualifiedMEETINGS discussing How to take your business from under $100M in revenue to over $100M in revenue. Listen at 9am: https://goo.gl/8qj6uR or catch replay links below. Has Technology Crushed the Art and Discipline of Sales? Got an Inferiority Complex about Sales Enablement? We’re in the middle of a massive hype cycle when it comes to enablement technology. How can sales leaders make sense of today’s technology landscape? 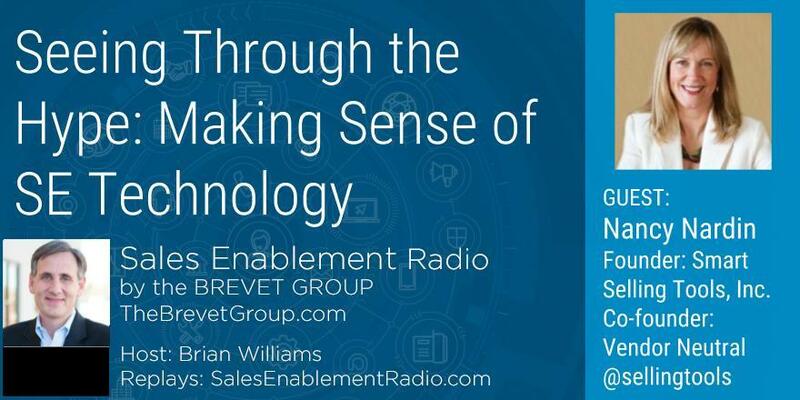 How can teams get focused on driving lasting sales productivity with the help of technology Brevet partner Brian Williams explores the issues and more with sales technology analyst Nancy Nardin. Nancy Nardin is a nationally recognized thought leader on sales and marketing productivity tools. Her firm, Smart Selling Tools – of which she is the founder and President – is dedicated to helping marketers and sellers apply process and technology to drive revenue. With nearly 30 years of sales and marketing expertise, Nancy is a frequent speaker and writer on using technology to drive revenue. Before launching Smart Selling Tools in 2006, Nancy was a analyst as Gartner Group and IDC, working closely with many of Silicon Valley’s leading venture capital firms and the portfolio companies. Smart Selling Tools doesn’t sell sales software. We just provide great information to help you find the right sales tools for your organization. The right tools can help your sales team spend more time with high-quality prospects that close and less time on everything else. Starting at 9am Pacific: Partick Morriessy welcomes John Kresia, VP Marketing at Hortonworks to talk about innovation and owning your category. Darryl Praill joins Rhoan Morgan on Revenue Rebels to cover the 4 steps to accelerating company growth. On Sales Enablement Radio, host, Ralph Grimse and his guest, Chris Day discuss crushing yoru quota using situational awareness. Matt Heinz topic is:Sales Objection Handling from the Master: Insights from Best Seller Jeb Blount. John Asher's guest is Brian Beveridge - Aligning Sales and Marketing Strategy and Execution to Optimize Growth. Amy Franko launched her book 10/30 - The Modern Seller. It opened to the Number 1 spot on Amazon for new books in the business category. She and Susan Finch cover what it means to be a Modern Seller on Rooted in Revenue. Revenue Rebels spotlights rule-breaking marketing and sales leaders who are accelerating business growth with a fanatically customer-centric approach and this month we’re featuring Darryl Praill, Chief Marketing Officer at VanillaSoft. Since joining the VanillaSoft team a year ago, Darryl has transformed the sales and marketing process and increased lead flow by launching an inbound marketing strategy and an aggressive digital marketing program supported by a strong sales and marketing stack. If you’re a marketing leader ready to elevate your company, tune in to this episode to hear Darryl’s 4-step approach to accomplish this and more. Our conversation is with Chris Day, inside sales leader at Bazaarvoice. We explore how to using situational awareness and pattern matching helps ramp new sellers faster and improves sales coaching and enablement. His team is crushing it, check it out! One of the most difficult and enduring challenges business leaders face is misalignment of sales and marketing. And Brian Beveridge knows how to fix this. Even if you have winning talent and winning solutions, if you can’t get your sales and marketing strategy and execution working seamlessly you’re missing out on money. While these challenges vary some between Enterprise and SMB markets, there are key steps business leaders can take to make substantial impact toward revenue growth. With decades of experience in this arena, Brian has key recommendations for how you can have immediate results to boost sales and crush your competition. Tune in to “Asher Sales Sense” November 1 at 3PM Eastern on asherstrategiesradio.com to hear John Asher talk with Brian Beveridge of Beveridge Consulting about “Aligning Sales and Marketing Strategy and Execution to Optimize Growth. Topic: The Modern Seller and Why You Need to Become One. Today's guest is Amy Franko, author of The Modern Seller. (available on Kindle or hardcopy). Some of the points we cover in this interview include big points taken directly from her book. Visit any of the shows below to catch up on replays before they air live or listen to the full line up.